Metallium, Inc. is attempting to manufacture coins made from as many different metals (and elements) as possible, typically 99 to 99.9% pure. My Metallium coin collection currently includes aluminum, titanium, iron, nickel, copper, zinc, silver, tin, and gold coins. Most metals are silvery gray because they absorb ultraviolet light and reflect visible light. However, relativistic effects contract some of the atomic orbitals of copper and gold so they absorb some visible light and reflect the complementary colors. (Heuristically, in large atoms some electrons move at near light speed and appear more massive.) These colors are a striking example of relativistic physics in everyday life — and of the Dirac equation corrections to the Schrödinger equation. 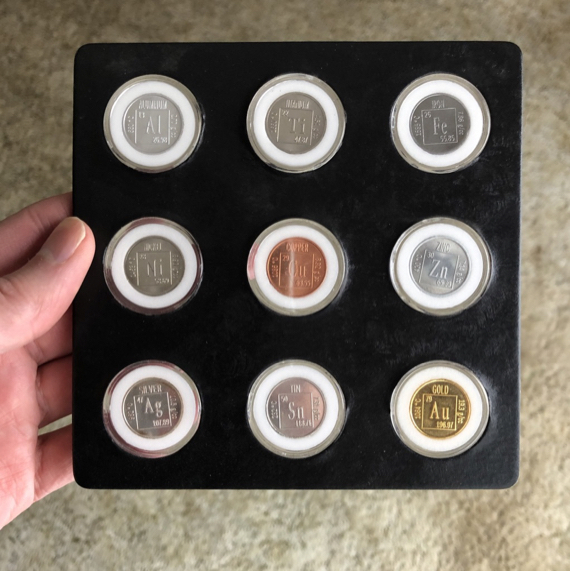 My Metallium coin collection includes Al, Ti, Fe, Ni, Cu, Zn, Ag, Sn, Au coins. All are silvery gray except Cu and Au, whose colors result from relativistic changes to atomic orbitals.